There’s a big business out there that you most likely aren’t taking advantage of. It’s the billion-dollar business of government contracting that the federal government shares with small businesses everywhere. Yet despite such tremendous business opportunity, some have shied away from government contracting because of “red tape.” In his book, The Small-Business Guide to Government Contracts: How to Comply With the Key Rules and Regulations…and Avoid Terminated Agreements, Fines or Worse, author Steven Koprince shares the inside scoop on how to stay compliant and educated to get a piece of that billion-dollar pie. As an experienced procurement lawyer, Koprince offers a legal perspective on how to avoid penalties and keep contracts alive and growing. He also makes it easy for the reader by providing a compliance-at-a-glance checklist of the most important rules and regulations to keep in mind. What’s more, the book includes an entire chapter dedicated to Women-Owned Small Businesses programs and how to capture opportunities reserved for women business owners. 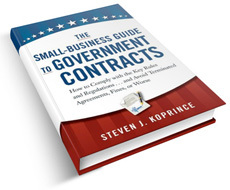 With real-life examples, The Small Business Guide to Government Contracts lays out the opportunities, risks and important rules that business owners need to know to maintain a strong government contracting business. All in all, it’s a great way for business owners to educate themselves and capture huge business opportunities they may have been missing out on.